A native Cuban, I moved to Miami, Florida when I was 12. I learned English in about two years, and was quickly involved in school activities as well as student organizations. My father and my brother were my inspiration in becoming an engineer. They taught me about power distribution, fire alarm systems, AutoCAD, electronics, soldering, and much more. I was accepted at FSU after living in the U.S. for only six years. Moving to Tallahassee proved challenging as I was alone in an unknown city. My adaptability to new situations, however, demonstrated I was able to survive on my own and take complete responsibility over my life, finances and studies. While in college, I was a member of the Society of Women Engineers, the Society of Hispanic Professional Engineers, Engineers Without Borders, the Institute of Electrical and Electronics Engineers, the Cuban American Student Association, and the Hispanic/Latino Student Union. I was also the president of Azucar Dance Company for three years. I graduated from Florida State University in May of 2009 with a Bachelor of Science degree in Electrical Engineering and with minors in Mathematics and Physics. In an effort to unite my engineering background with my passion for diving, I enrolled in Underwater Crime Scene Investigation (UCSI) at the FSU Panama City campus. I obtained several degrees of diving certification as well as the UCSI certificate upon completion in May of 2012. Continuing my education at the FSU PC campus has proved rewarding. I have learned about unmanned systems such as ROVs, sidescan and multibeam sonar. 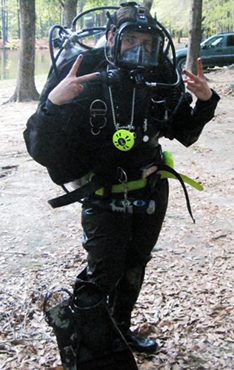 I have learned and put into action leadership skills in organizing and planning for dives. I have program using LabVIEW, and even created a remote control for a semi-autonomous rover (read about it in my portfolio). As an electrical engineer, I am now in the search for a professional career. My involvement in my studies, organizations and community service, has helped me develop remarkable skills. I am now more responsible and more efficient in time management, I have been involved in numerous activities, I have worked with different kinds of people, I have the capacity to learn anything, I am not afraid of tough schedules, I have experienced the trials and tribulations of different businesses, and I think no challenge is too big. My only desire is to be able to use all of my expertise and potential in a challenging position.